This is such a beautiful dish, and very flavourful. 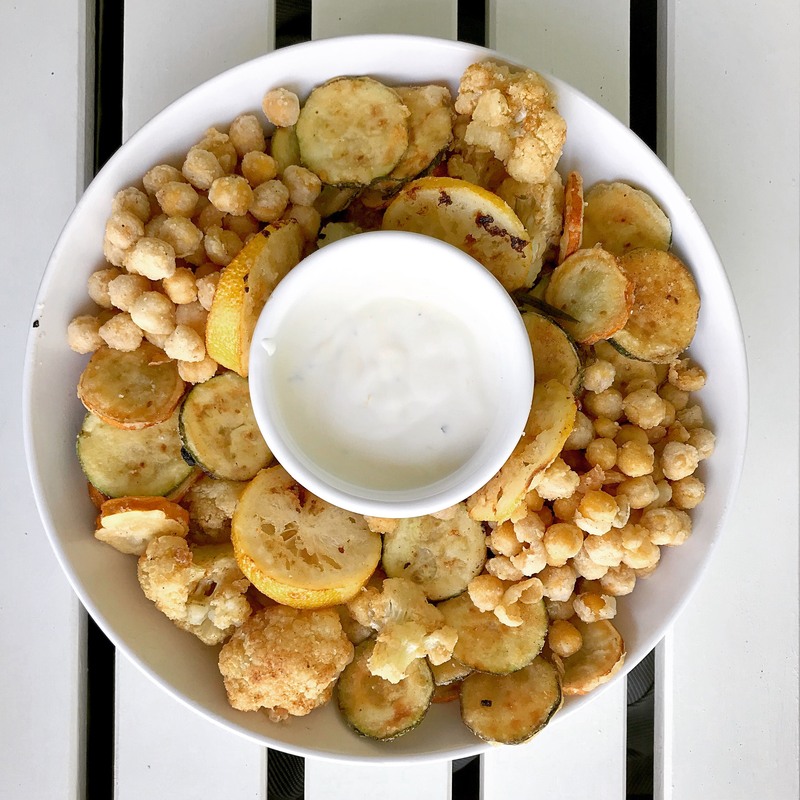 Veggies fried in rosemary oil with a lemon rosemary mayo is a great dish to enjoy in the summer. You can use all sorts of vegetables, but I really like the zucchinis and cauliflower. The chickpeas get crispy but are still soft in the middle. And they all are lightly flavoured and scented with rosemary. For the Fritto Misto: In a medium bowl, mix together the flour, baking powder, salt and pepper. In a large saucepan, pour the oil to fill the pan about 1/3 of the way. Add the sprigs of rosemary to cold oil. Heat over medium heat until the rosemary starts to fry. Meanwhile, dredge the veggies and lemon slices in the flour. Fry the dredged vegetables and lemon in their own batches and fry for 1 to 3 minutes until lightly browned. Drain on paper towels. Sprinkle with salt while still hot. For the lemon mayonnaise: In a small bowl, mix the mayonnaise, greek yogurt, and lemon juice together until smooth. Add chopped rosemary. Pour into a small dipping or serving bowl. This dish is made to order. The fried veggies will not keep well. The dip you can refrigerate.